After having been announced for a long time, in September 2011 the German manufacturer reflecta finally brought its first medium format scanner MF-5000 on the market. So it is the first time that you can scan except 35mm films also 120/220 medium format roll films (6x4,5, 6x6, 6x7, 6x8, 6x9, 6x12) with a reflecta film scanner. The Reflecta MF5000 as well as the Reflecta MF5000 + SilverFast Ai Studio are available in our online store. With the performance data given by the manufacturer and the exterior design the device is supposed to be an alternative to the Nikon Super Coolscan 9000 ED, which is not produced any more. So reflecta accepts a heavy inheritance, since the image quality of the Nikon scanner is up to now only reached by high end scanners like the Hasselblad Flextight scanners or even drum scanners. These devices, however, cost a multiple of the Nikon. In this review we want to examine the image quality of the reflecta MF5000. Of course we also go into the equipment, handling, scan speed and other buying criteria. Since the Nikon Super Coolscan 9000 ED is a reference in the field of medium format scanners, we will again and again compare these two scanners in this test report. If you once bought a Nikon Super Coolscan 9000 ED medium format scanner, you got this heavy device in a huge box. In contrast, the reflecta MF5000 is delivered in a compact box (only 8,5 kg), which contains execpt the scanner everything you need in order to immediately start scanning 35mm films and 120/220 roll films. The MF5000 has the dimensions 320x165x160 mm (L x B x H) ans is so much smaller than the Nikon 9000. With a weight of just 5,3 kg it is almost half as heavy as the medium format scanner from Nikon. The Reflecta MF5000 exceeds indeed any 35mm film scanner in terms of dimensions and weight, however, it is still so small and handy that it fits on any desk and adapts perfectly to other computer peripheral devices. 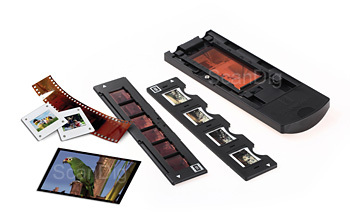 In the scope of delivery there is a film holders for up to 4 mounted 35mm slides, a film holder for 35mm film strips up to 6 frames and a film holder for medium format film strips. The two 35mm film holders are shifted into the scanner from the left or right side, whilst the medium format film holder is shifted into the scanner at its front side. Here you find on tht right side above except a blue status LED the only two operation elements of the MF5000, namely the power button and the Scan-button for starting a scan process. In most cases, however, this will be done by the scan software. Like all reflecta scanners the MF5000 is delivered with the manufactuerer's scan software CyberView by default. In the box there is a detailed manual in different languages, as well as the power supply unit, and a USB cable (USB 2.0). The cables have to be connected at the corresponding interface at the backside of the device. At the front side of the scanner below the medium format insertion there is a label with the MagicTouch emblem. This is an important feature of the reflecta MF5000: MagicTouch is a hardware based dust and scratch correction function, which recognizes cavities (scratches) and elevations (dust) on the film surface with the help of an infrared scan, like the similar techniques ICE and iSRD to. So disruptions can be eliminated almost completely. How well MagicTouch works, and how the results are compared to ICE and iSRD, you can read in the chapter image quality later. The manufacturer gives a nominal resolution of the CCD sensor of 3200 ppi. For medium formst scans this resolution is sufficient for the most applications. 35mm scans can be enlarged up to A3 (21x40 cm) in good quality with this resolution. This, however, just holds in theory, since how the effective, practical resolution of the scanner is, we will examine also in the chapter image quality. In this chapter we also examine the density range of the MF 5000. The maximum density is given by the manufacturer with the low value 3.6, which means an average performance of the scanner. From the maximum density of 3,6 one can conclude that the density range is a bit higher than 3,0. This means that you have to expect some deficits at very bright and very dark areas of high contrast films. The installation of the MF5000 does not differ from other USB devices: First you install the scan software, here it is CyberView, then you connect the scanner to the power supply system and to the PC via USB 2.0 and then finally you switch it on. The operating system then displays the message that a new hardware is recognized and then automatically installs the required driver. A moment later the scanner is ready to use and you can start the scan software. Before you start scanning you have to wait a moment until the blue LED at the front sops blinking and glows permanently, which significates that the scanner is now ready for operation and you really can start scanning. The installation and seupt of the MF5000 is really without any difficulties so that beginners normally don't encounter problems. If you have problems against expectation you first should make sure that there are no other USB devices like webcams or printers connected to the computer, since sometims they lead to problems at the automatic hardware recognition process. Furthermore you should connect the scanner only at a USB port of the computer which is directly connected with the motherboard of the PC. The connection via a USB hub or a USB-port which is located at the front side of the computer often leads to problems. So, please, connect the scanner only to a USB port at the backside of a computer or directly to a laptop. If the scanner is not beeing recognized it often helps to try other USB ports at the backside of the PC. The Reflecta MF5000 is a medium format scanner which is designed and developed especially for these films. Anyway we start with the scanning of mounted 35mm films, since certainly any medium format photographer has also 35mm films in his archive and wants to scan them. For the scannning of mounted 35mm slides there is a film holer in the scope of delivery of the reflecta MF5000, which can hold up to four slides at a time. These are inserted quite simply into slots at the top side of the film holder. The optimal alignment of the slides is made sure with the help of the letter combination abc at the front side of the film holder. If you insert your slides differently into the holder, it is not a problem at all, since you can rotate and reflect any picture within the scan software after the prescan. You don't have to be afraid of a quality loss when slides are aligned wrongly. The slide mounts may have a width of maximum 3,2 mm, which is sufficient for all standard products, also thick glass frames. As already mentioned the 35mm film holders have to be inserted into the scanner at the left or right side of the scanner. The two arrows at the left and right end of the slide mount holder significate that you can insert it into the scanner both at the left side and at the right side. And you can move it also in both directions. The slots at the bottom side of the film holder make sure that it locks alway at the right position, i.e. exactly with a slide in front of the sensor. This feature is necessary, since the MF5000 does not contain a viewing window for checking the exact position of the slide. So if you want to digize a certain image, you just have to remember its position within the film holder and count the index marks at the insertion of the film holder. This is not a problem in practice, especially since you normally scan all inserted slides step by step. As soon as the desired slide has been shifted in front of the sensor you can do the prescan. Then you select the desired scan area and adjust the resolution and other parameters. If you have done all settings according to your desires you just have to press the scan-button within the scan software and the scan is started with your settings. In order to scan the next picture you have to shift the slide mount holder forward to the next position - there is no automatic film holder transport mechanism at the reflecta MF-5000. Now you do the next prescan, adjust the settings and start the fine scan again. An automatic batch processing of all slides inside the slide mount holder as the Nikon Super Coolscan 9000 ED does, is not possible. After each single scan you have to interfere. 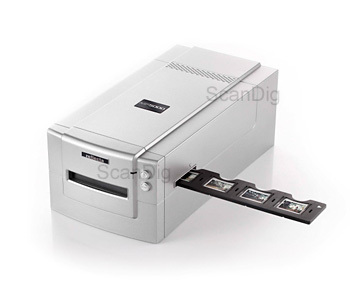 All in all scanning of mounted 35mm slides is an easy matter with the MF5000. The slides can be inserted quickly and simply. Only the scan of a specific slide inside the slide mount holder is a bit uncomfortable, since one cannot see which slide is right in front of the sensor at the moment. For the right positioning, however, one gets a good feeling after having scanned hundreds of slides. If you have a larger amount of slides to digitze we recommend to buy a second slide mount holder. Because you can fill it while the other one is inside the scanner. So the work flow does not have to be interrupted unnecessarily each time all slides within one holder are finished. In spite of the MagicTouch function it is very reasonable to clean the slides before scanning. The less this function has to correct the better is the image result, because if there is a large dust particle on the film, even the automatic dust and scratch correction function cannot correct it. Furthermore you should be careful that as few dust as possible gets into the interior of the scanner. It helps a lot if you blow on the slides in the slide mount holder with clean compressed air; you can remove rough dust by the use of a air brush; it even works better and more effectively with an antistatic brush from Kinetronics. All in all one can conclude that scanning mounted 35mm slides works comfortably and without major problems with the MF-5000. The slide mountholders are good and the user cannot make wrong a lot. Scanning of mounted slides with the reflecta MF5000 is comparable with scanning such slides with the 35mm scanner Reflecta ProScan 7200. If you have a big archive of 35mm slides you better take a magazine scanner like the Reflecta DigitDia 6000 or the Nikon Super Coolscan 5000ED. For the digitalization of 35mm film strips there is a film strip holder in the scope of delivery of the reflecta MF5000, which can take a film strip with a length of up to 6 pictures. It is irrelevant if it is positive or negative material - the MF5000 can process both. Negatives will be transferred into positives, i.e. normal digital images, automatically during scanning. In order to insert a film strip into the film strip holder you first have to open it by unlocking the lock at the front side and then swing open the upper half of the film holder. Two guide bars above and below the film strip help for its alignment. The separating strips between the single images are equal on the separating strips of the film strip and make sure that it lies as flat as possible inside the holder, so that there will be no unsharp parts at the edges caused by curved film material. The film strip is beeing fixed when closing the film strip holder. The insertion of strongly curved or rolled film strips may become a complicated matter, since you have to try to hold the film strip at its total length with your first hand, while you have to close the holder with the other hand. Not only because of this we always recommend wearing cotton gloves, when working with film material, since no matter how careful you are: If you work just with your blank fingers, you cannot avoid it totally that you touch the film material, and they will be remarkable in the scans. I want to mention that it is also possible to insert several small film strips or even singular pictures into the film strip holder. In order to to this you need a smooth hand and much patience since the film parts tend to move independently from each other when closing the film strip holder. The inserting of film strips of singular film pictures works better with the use of specific tweezers with flat paddles, since you can grap film material better with such tweezers. But attention, normal tweezers usually used for handling stamps may produce scratches on the film material when grabbing it. After having inserted the film strip or the film strips into the film strip holder the scanning procedure does not differ from scanning mounted 35mm slides: You shift the film strip holder from the left or right side into the MF5000. Also here groovings at the bottom sideof the holder care for the correct positioning of the film material. The image which you want to scan has to be set in front of the sensor, then you make a prescan, make all necessary and desired settings and finally you carry out the fine scan. As soon as this is finished you transport the film holder manually to the next image and repeat this procedure until all images on the film are digitized and stored on the hard disk of your computer. With the help of an optional second film strip holder you can make your work flow better by feeding the second one whilst the first one is still inside the scanner. As for the scanning of mounted 35mm slides also for the scanning of negative strips there is no batch mode, i.e. the scanner cannot scan all images on one film strip automatically in series. Rather you always have to scan a singular picture, then shift the film strip holder manually to the next image position, then scan the next image and so on. Of course this is time consuming and troublesome, but usual at most film scanners on the market. We recommend a rough cleaning of the film strips before scanning as we already did for mounted 35mm slides, so that we advice to use an anti dust spray as well as an anti static brush. Also for scanning film strips one can conclude that it works well and simply with the reflecta MF-5000 as long as you don't have to process very large amounts of films. If you have to digitize hundreds or even thousands of negative strips we recommend a scanner with an automatic film strip feeder like the Reflecta RPS 7200 Professional or the Nikon Coolscan 5 ED. 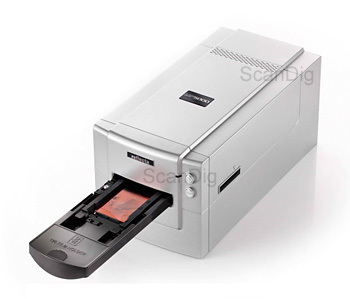 Such scanners feed the film strip automatically and scan all images on it in series automatically. The above described procedure for scanning 35mm films is already known from other reflecta film scanners. Let uns finally get to the big new feature of the MF5000: scanning medium format 120/220 roll films. After all this is the main application of the MF5000 and the main reason for buying this scanner compared to much cheaper 35mm film scanners. The medium format film holder which is included in the scope of delivery reminds noticeable to the counterpart of the Nikon Super Coolscan 9000 ED: At the two long edges of the film strip there are two narrow rubberized flaps which fix the film. One of these flaps can be moved crosswise to the film strip so that you can span the film strip by pulling that flap outwards after closing the holder. Then you hold that flap and fix it at this position by using the lock. So the film material is strained and you can equal a curvature, if it is not too extreme. However, the reflecta MF 5000 medium format film holder does not achieve the mechanical quality of that of the corresponding Nikon film holder. The medium format film holder offers a scan area of maxiumum 11,8 cm length. So you can insert two images of the format 4,5x6 or 6x6, or just one image of the formats 6x7, 6x8, 6x9 or 6x12. Whilst the Nikon LS-9000 ED can scan medium formats only up to 6x9", the reflecta MF5000 can process also medium formats up to 6x12"; therefore the reflecta gets a large plus factor and that is a good news for many panorama photographers. For even larger film formats, like 6x17 or 6x18, or for film strips with 3 6x6 images, you have to choose a flatbed scanner or a big Hasselblad Flextight X1 scanner. Like at the 35mm film holders of the MF5000 also on the medium format film holder the correct alignment of the film material is made sure by the letters abc printed on the film holder. However, any other alignment can be corrected within the scan software without problems. Of course also when handling medium format films we strongly recommend to wear cotton gloves, and also we reecommend to clean the film material before scanning with clean compressed air and/or an anti static brush. After loading the medium format film holder with your film you shift this into the scanner at its front side. Differently to the 35mm film holders there are no fix positions - you just shift the film holder into the scanner until the block and then you make the prescan. Then you see the complete content of the film strip in full length within the scan software as a preview. Then you can set one or several scan frames and determine exactly which part or which parts to be scanned. So scanning medium format 120/220 roll films with the MF-5000 is not a complicated matter. Especially the fact that you see the complete content of the film holder after the prescan at a time and that you do not have to find the right position - as it is with the 35mm film holders - simlifies the work flow enormously. So one possible source of errors is eliminated: When scanning medium format films with the reflecta MF5000 it cannot happen that you don't scan the right part of the image because of a wrong format choice within the scan software or a non 100% exact alignment of the film. Also while scanning medium format films you can safe a lot of time with a second medium format film holder, by loading it with a new film while the other film holder is inside the scanner. The reflecta MF5000 is suitable for digitizing medium format films up to 6x12 cm very well. While the insertion of the film material into the medium format film holder is a bit extensive, the real scanning works similiar to that of scanning 35mm films. Where are the limits of the reflecta MF5000? On the one hand side there is the maximum film length of 6x12 cm; larger panorama films and longer film strips cannot be processed with the MF5000. On the other hand the medium format films must not be inside mounts, or they have to be taken out from the slide mounts before scanning. 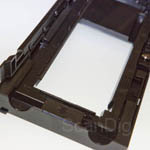 For the MF5000 there is an additional (optional) medium film holder available. This can take film strips of a length of 22 cm, and the maximum scan area is 5,7x14cm. This 22cm film holder came on the market about one year after the MF-5000. This film strip holder has the advantage that you can insert two 6x7cm pictures and that you don't have to cut the usual film strips with 3 6x6cm pictures on it. You only have to rotate the film strip after the first scan by 180°. Another advantage is the maximum scan area of 5,7 x 14 cm, so that you can scan medium format panorama films up to a length of 14 cm. The fixing bails of this adaptor are equiped with magnets. You can recognize them easily at the backside of the film strip holder. So there is no wearing even after frequent use of the fixing bails. Like the standard medium format film holder also this optional film strip holder is equipped with a moveable element in order to strain the film strip. With the locking pusher you can fix the film strip. This 22cm medium format film holder is available in our online shop. The reflecta MF5000 is delivered with the scan software CyberView like all other scanners from the Rottenburger manufacturer reflecta, which we had as version 5 for our tests. CyberView offers basic functions for controlling the scannner and the image settings. The scope of the image setting possibilities is rather small, the user just has the tools variations, color matching and curves and layers. With the help of the variation settings one can control the colour and brighness of the image by small thumbnail pictures. The color matchingoffers three controllers (RGB), one for brightness, one for contrast and one for saturation. With the curves and layers tool one can set the gradation curves and control the tone values. Unfortunately the setting possibility is rather imprecies within all tools, and other sophisticated tools like a selective colour correction is not there at all. One annoying feature of the software is worth to mention: The scanning frame set inside the prescan preview is maintained only roughly in the fine scan. At all scans, we have made, the real image part was shifted, so that parts of the image were missing at least on one side whilst on the opposite site there was scanned too much. Because of this the scanning frame had to be set always larger than necessary, and after scanning the image had to be cut to its right size within the image editing program. Optionally there is a bundle of the Reflecta MF-5000 with SilverFast Ai, which is a professional scan software from the German software manufacturer Lasersoft Imaging. SilverFast Ai Studio has the great advantage, that a colour calibration of the scanner is possibile with the help of an IT-8 target. This leads to a significant increase of the image quality. But also without an IT-8 colour calibration one can achieve an essential better image quality by very good image processing algorithms and numerous professional image setting possibilitites. You can find detailed information about SilverFast on our SilverFast FAQ site. Information about the calibration of a scanner can be found on our website about scanner calibration. Let's get to the most important point of this review: How about the image quality of reflectas first medium format scanner MF-5000? Is it good enough for high-value medium formats or does it even get close to that of the Nikon LS-9000? In order to answer this question we first take a look of the effective resolution in practice. The manufacturer gives a maximum optical resolution of 3200 ppi. This yields an image file with 4535 x 3024 pixels when scanning a 35mm slide. So from a 35mm film one gets an image file with aprox. 13,7 mega pixels. If you scan a 6x6 medium format with the highest resolution of 3200 ppi the resulting digital image will consist of 6930 x 6930 pixels. Thus a 6x6 medium format scan creates an image file with about 48 million pixels. At a scan with 3200ppi you can still recognize the horizontal lines of the element 6.1 and the vertical lines of the element 5.6. This yields an average resolution of about 3050 ppi, i.e. 95% of the nominal resolution of the scanner. With 95% of the nominal resolution of 3200 ppi the scanner achieves an enjoyable high value, since many times scanners don't achive more than 50% of the resolution stated by the manufacturer in practice. What does it mean in practice? Let's have a look at the pixel numbers which can be derived from the effective resolution: A 35mm scan with 3200 ppi, calculated to the effective resolution of 3050 ppi, still consists of about 4300 x 2900 pixels, i.e. about 12,5 mega pixels, which corresponds to an image file of about 36 MB in the TIF-format. A good value, which lies in the field of good modern digital cameras. So you can realize high value prints up to DIN A3 (30 x 40 cm) without any problems. As a potential competitor of the Nikon Super Coolscan 9000 ED the reflecta MF5000 has to compete with this top scanner: The Nikon provides an effective resolution of 3900 ppi (at a nominal resolution of 4000 ppi) which means that a 35mm scan yields an image file with approx. 20 mega pixels (5528 x 3685 pixels). The resulting file size is about 58 MB in the TIF format. With such a file you can create high value prints up to DIN A2 (40 x 60 cm). With this possibility the Nikon lies clearly over the MF5000 and also over actual digital cameras. Even more significant becomes the difference between these two scanners if one compares the data for medium format scans. A 3200 ppi scan of a 6x6 medium format film, converted to the effective resolution of 3050 ppi, yields an image file with about 6600 x 6600 pixels, i.e. 43,5 mega pixels. Such a TIF file has a file size of about 130 MB and can be enlarged up to 100 x 100 cm in high quality. A scan with the Nikon Super Coolscan 9000 ED with 4000 ppi, converted to the effective resolution of 3900 ppi, yields an image file with 8445 x 8445 pixels for an 6x6 medium format film, i.e. an image with 71,3 megapixels and a file size of 204 MB in the TIF format. With these values an enlargement to 140 x 140 cm is possible. In spite of this big difference one can say, that the reflecta MF5000 achieves a good resolution value and that the attainable file sizes are sufficient for most applications. The resolution values of flatbed scanners - even from high value flatbed scanners - are exceeded by the MF-5000 by far. This flatbed scanner has a nominal resolution fo 6400 ppi according to the manufacturer's data, and our test has shown that the scanner has an effective resolution of just 2300 ppi. A 35mm scan (3,6 x 2,4 cm) results in a digital image of 3260 x 2173 pixels with that resolution, i.e. only about 7 megapixels with a file size of 20,3 MB in the TIF format. High value prints are only possible up to 20 x 30 cm with this quality. 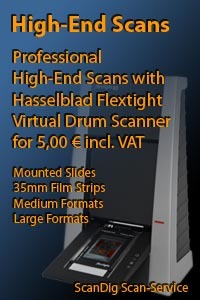 We remember: A 35 mm scan with the reflecta MF5000 can be enlarged in good quality up to 30 x 40 cm. In terms of resolution the reflecta MF5000 beats any flatbed scanner with transparency unit and therefore gets a clear recommendation for scanning medium format slides. Concerning the density range the MF-5000 lies in the middle field. Drawing in very bright and very dark areads is achieved in a quality which corresponds to the 35mm film scanners from reflecta. The MF5000 does not reach by far the performance of the Nikon Super Coolscan 9000 ED, but also here exceeds high value flatbed scanners like the Epson Perfection V750 Photo. The dust and scratch correction MagicTouch yields mostly good results. However, unfortunately we had to realize, that the one and other dust grain was not detected. On the contrary a couple of times within fine picture details like a current cable there could be detected image disturbancies. 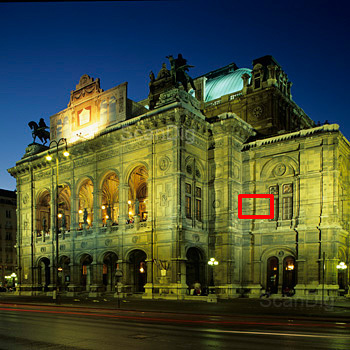 The image shows a detail of a scan of a 6x6 slide, it shows the opera in Vienna. Inside the pictuere there is a red marked detail, which you can enlarge to 100% by a click on the thumbnail and then see the mentioned effect. The image switches every three seconds between the scan with the reflecta MF5000 and the Nikon Super Coolscan 9000 ED. For this comparison we have converted the 3200-ppi scan of the MF5000 to 4000 ppi, so that both scans can be compared directly with each other. Fortunately such errors occur seldomly, and only at high contrast image details, so that the function principally is usable. The ICE function of the Nikon scanners, however, provides clearly better results. Additionally it is worth to mention that you can realize the essential higher sharpness in the scan of the Nikon Super Coolscan 9000 ED. After the rollout of the reflecta MF-5000 it took more than half a year until finally a suitable SilverFast software came onto the market. A medium format scanner like the reflecta MF-5000 really calls for a professional scan software, which now is available with SilverFast Ai Studio in the version 8. The CyberView scan software, which is included in the standard scope of delivery of the reflecta MF5000, enables the user to produces his first scans quickly and intuitively, however, the setting possibilities within the scan software are rather modest. Of course there are tools like variations, colour matching and curves and layers, however the setting controllers only allow raw settings at the image and are quite imprecise. With the SilverFast Ai Studio scan software from Lasersoft Imaging there can be made professional and finly nuanced settings. The scope of setting possibilities and filter options is so big, that the SilverFast scan software can keep up with the one and other image editing program. SilverFast Ai Studio distinguishes itself not only by numerous controllers and buttons for the image optimization but also by better and more sophisticated image processing algorithms. Here one realizes, that the manufacturer Lasersoft Imaging has collected experiences in the field of scanner software for many decades. So SilverFast Ai Studio just produces better digital images, because the raw data of the scanner are processed better. One realizes the differences between scans with SilverFast Ai Studio and the CyberView software immediatley, even if only a couple of image editing options are activated in SilverFast. Really striking becomes the difference if an IT-8 colour calibration is done with the SilverFast scan software. For this an IT-8 target is needed which is available for different film sorts (Kodak, Fuji, Kodachrome). By the IT-8 calibration the colour errors of the scanner are compensated and stored in an ICC profile. As result one obtains true colour scans, which need less post processing in the image editing program. The IT-8 colour calibration is only applicable for positives. In order to achieve better image results at negative filmes, too, SilverFast offers the so called NegaFix dialogue. 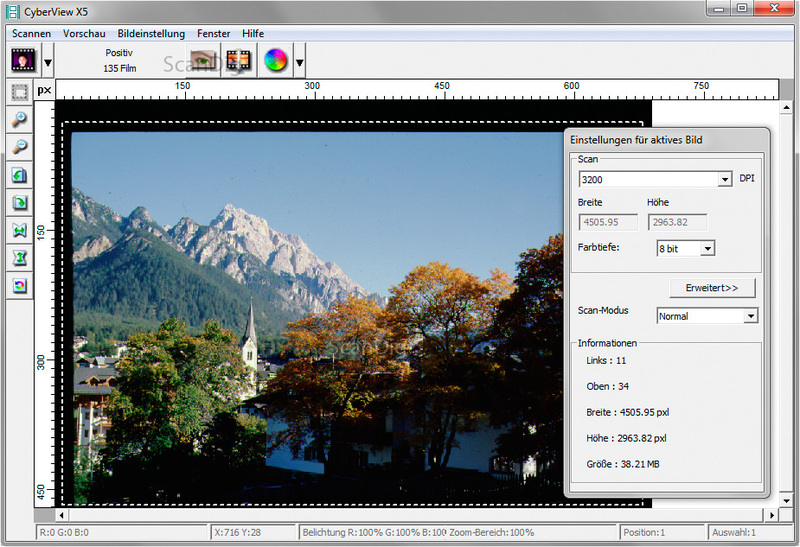 In this dialogue a film profile can be chosen for the film type to be scanned, so that one achieves significantly better colours at negative scans, too. You can find more information about that on our SilverFast FAQ site. If you analyze scans in the shadow areas and in very bright areas you can recognize again, that SilverFast achieves better results than CyberView, especially if the Multi-Exposure function is activated. With this function the original is scanned twice with different exposure settings, and from the two scans an optimal image is computed. Best the quality increase by SilverFast can be shown at a couple of examples. We have scanned a medium format slide and a medium format negative both with reflecta's scan software CyberView and with Lasersoft Imaging's scan software SilverFast Ai Studio 8. In order to demonstrate the quality difference objectively we have done without manual corrections like tone value correction. Only in CyberView we had to activate the preset auto correction functions "Auto-Balance" and "AutoColor" at the negative scan, in order to gat a usable scan. For demonstration we also show the uncorrected image. If you click at one of the images, a new window opens in which the two different scans are displayed alternatively. It becomes clear, that the raw scans of SilverFast already provide significantly better and more natural colours like they correspond to the original. All in all one can conclude that the reflecta MF-5000 yields essentially better image results in combination with SilverFast Ai Studio than with the standard CyberView Scan-software. For a high value medium format scanner like the MF-5000 we recommend the first-class scan software SilverFast Ai Studio. In our online shop we offer the Reflecta MF-5000 also in a bundle with SilverFast Ai Studio and with different target combinations. 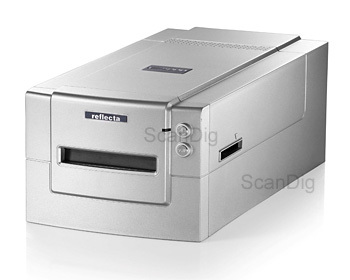 In order to measure the scanning times of the reflecta MF-5000 the scanner was connected via USB 2.0 to a PC with Core i3-860 CPU and 4GB memory. In the following table there are our measurements. As you can see, the MF5000 is a fast scanner. A 35mm scan in the highest resolution and activated automatic dust and scratch correction within only 01:20 minutes is a very good value. Also at scans of medium format films the MF-5000 distinguishes itself: The measured time of only 04:19 minutes for a scan of a 6x6 slide in the highes resolution with MagicTouch is only bitten by the Nikon Super Coolscan 9000 ED - and that only scarcely. It is noticeable that the times of positive and negative scans don't really differ. In earlier generations of film scanners there were great differences, since the convertion of the orange-brown negative mask needed much power from the CPU. You can also realize, that the scanning times don't increase essentially by the automatic dust and scratch correction function. The reflecta MF5000 is a very fast scanner both in the 35mm area and in the middle format area. The short times between the scans can be used perfectly for loading a second film holder or for the image editing. Reflecta limits the warranty for the MF-5000 to a number of 8000 scan processes. A scan process can be an index scan, a prescan or a main scan. If you choose the option multi-exposure within the scan-software, the film will be scanned twice and the scan counter increases by 2. The same holds for multi times scans. In autumn 2018 this warranty restriction was abandonned by reflecta. The Reflecta MF5000 and film holders for Reflecta scanners are available in our online shop. The image quality is good, the resolution is sufficient for most practical application, and the MagicTouch function does a good job except for a couple of seldom deficits. The use is simple, but not too comfortable, since an automatic transport of the film holders is missing - after each scan a user interaction is necessary. So we can recommend the reflecta MF5000 anybody who needs a better image quality than a fladbed scanner achieves, but who does not want to spend the enormous sum for a Nikon Super Coolscan 9000 ED or a Hasselblad scanner with their excellent image quality, which still - and this must be said clearly, - exceeds the image quality of the MF-5000 by far. If you operate the medium format scanner reflecta MF-5000 with the professional SilverFast Ai scan software instead with the standard CyberView scan software, you will get a better image quality thanks to the IT-8 colour calibration, better image processing algorithms and professional setting possibilities. This test report describes the test object as we have received and tested it. Changes in configuration, specification, hardware, software etc. after execution of our test will not be maintained automatically.